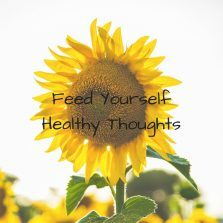 Feed yourself a steady diet of healthy thoughts. For those with a sweet tooth: Instead of eating sweets whenever/wherever and feeling guilty about it – save the experience for when you’re in a fun social setting. For excess snacking/midnight munchies: Tell yourself to delay eating until later. By understanding that you are not ultimately depriving yourself of this food (just delaying it), you become satisfied with the mental agreement and the craving subsides.